(1) Is 1h10m a realistic goal for my next 10k or is that too much? I now got to the stage where I am running 3 times a week, 6-8 miles a week in total. I have about 12 weeks left until the race and although I plan to increase my mileage, I won't have time for a lot more than 3 sessions a week. I should also mention that I'm using more or less the same training plan as last time, but trying to do everything a bit faster. (2) My current runs are all supposed to be easy runs (I'm going to introduce speed work a little later in training). I run them at about 13:10-13:20 mpm. From the breathing and heart rate point of view this is very easy for me, but my legs are always very sore - even after one mile. (I don't think it's an injury - after I rest for a day or so, they are usually back in action). Any suggestions on how to address this problem? Thanks for your questions about your second 10k race. I think your goal to reduce your time from 1:13 to 1:10 is not unreasonable. A lot will depend on putting in the right amount of work as well as being consistent with your training. Based on your current running training times you might even be able to go faster than 1:10. Training three times / week for a 10k race is sufficient. Just try to make sure that you do this each and every week. As said before, consistency is important. You still have a reasonable amount of time left. I would suggest that you focus on adding mileage first and foremost. How to do that? Check my increasing mileage safely page. The mileage you are doing, being at the start of your running program, is still low. There is a lot of benefit in adding those miles and getting to a long run of 6 miles or over. Being able to cover the distance in training provides a lot of confidence for the race, as well as the necessary endurance to then do it faster. 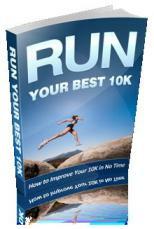 Best Running Tips :: 10k Running Program for Beginners - A 12 Week Program for Your First 10k. This may not be your first 10k, but it's been a while since you have been running, so I think it is a reasonably appropriate program. Regarding the leg pains: it sounds mostly like your legs getting used to the mileage you are doing. I get the exact same thing the last 2-3 miles of my long runs. It is the body protesting against the extra stress you are putting it through. As long as the discomfort is gone the next day I would not worry too much about it. With only three days of running your legs should get plenty of down-time. If pains persist, then, of course, take a bit of a break from running. Thanks so much - your response is really helpful!